The magician will now perform the famous trick of sawing the lady in half before your very eyes! And then, by her magic powers, the magician will reconnect the two halves of her victim assistant without harm, and will not even leave a scar! "Oh, no! What happened to my middle?!?!" Stay tuned for the next installment of this thrilling adventure! 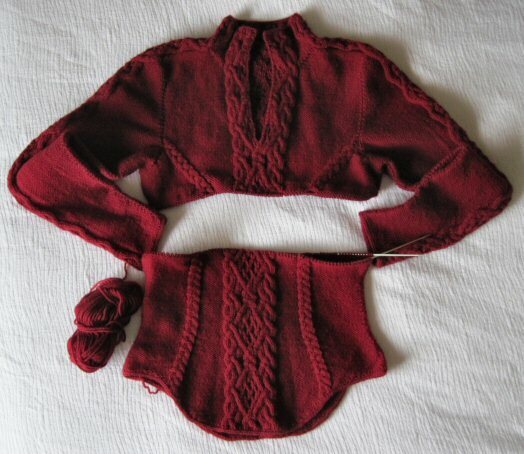 Actually, I’m fairly confident the reconnecting will go well – I ‘d just as soon not have to re-knit the whole bottom half of the sweater. If there’s one thing I’ve learned over the years, it’s that if I am not happy with a project when it’s finished, I had better either fix it or pitch it. There’s no point in having something around that will annoy me every time I look at it until I put it somewhere I won’t see it. So even if I have to start all over, I WILL have something that I truly LIKE by the time I’m finished. Oh, I’m sure you’ll make it right. But that was a startling pic to see early in the a.m.! and I agree re: fixing the mistakes….I have sweaters I won’t wear & I should either gift of frog them.